Sandcastle Beach Girl ~ Do what makes your soul shine. Here is a sweet tropical and nautical scene with an inspirational message. Sentiment: Do what makes your soul shine. Isn't she the cutest? This is so typical of summer. I made a little porthole view and layered the sentiment on patterned paper. The beach is watercolor. The girl is popped up for a 3-D look. I made a video tutorial for this card. Supplies: Unity Stamp Co. Shiny Little Soul Kit by Phyllis Harris, MFT & My Creative Time dies, Ranger distress markers, Copic markers, hemp and BasicGrey paper. This adorable girl with her horse scene is extra sweet paired with this heartfelt sentiment. Sentiment: My favorite place in all the world is next to you. The image was colored in with Copics and trimmed with coordinating patterned paper and flag embellishments. I think this is perfect for friendship, family or love occasions. I made a quick tip video tutorial for this project. Supplies: Unity Stamp Co. Simple Places Kit by Phyllis Harris, Copic markers, My Mind's Eye paper, hemp, rhinestone and My Creative Time dies. Here is a set of holiday tags with the snowmen on kraft color paper. I love how the colors pop this way. My favorite thing about this snowman is the hair. How FUN. Supplies: Unity Stamp Co. Wintertime Friends, Copic markers, white colored pencil, washi tape and MFT die-namics. Link Up: Simon Says Stamp Wednesday Challenge ~ We're seeing stars. Supplies: Unity Stamp Co. Wintertime Friends, My Favorite Things & My Creative Time dies, Copic markers and glitter. Today, I am up on the Unity blog with this daisy card. Sentiment: I miss you a little too much, a little too often & a little more every day. Watercolor was used to color in the daisies. I trimmed the card using lace, lacey die-cuts and patterned paper. I wanted it to have a warm country look. Here is a quick tip video tutorial for this daisy card. Supplies: Unity Stamp Co. There Are Always Flowers July 2017 Layers of Life and Too Much Too Often Daisies; Prima water soluble oil pastels, lace and BasicGrey paper. Have a lovely summer weekend. CardMaker blog project today... Make a wish. 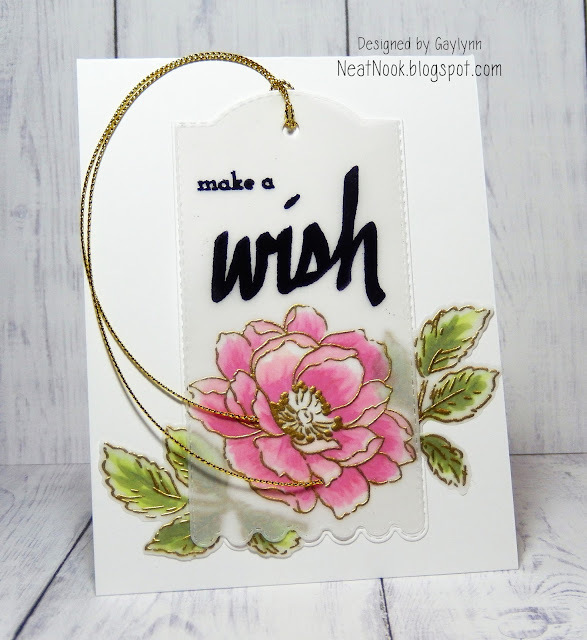 Today, I am up on the CardMaker Magazine blog with this make a wish flower card. I am showing a tutorial on my favorite craft technique. To see the full project post, tutorial and the details, click CardMaker to be directed there. Here is a cute baby boy congratulations handmade card. Sentiment: Congrats on the cute new poop machine. Supplies: Unity Stamp Co. Unicorns & Rainbows and Stinkin Cute Add On; My Mind's Eye paper, Copic markers, Lil' Inker Designs dies and hemp. 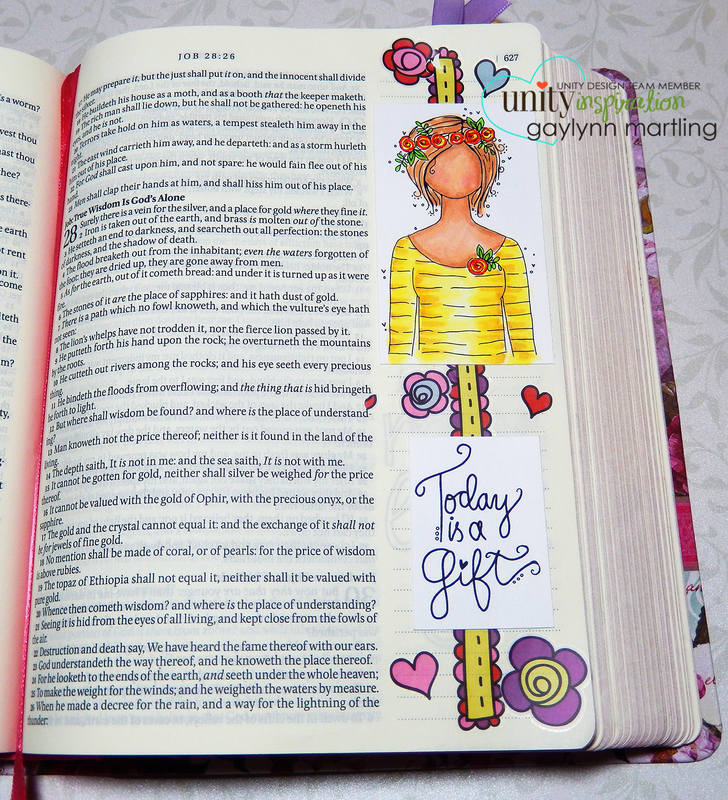 Today, I am sharing another bible journal page. Sentiment: Today is a gift. 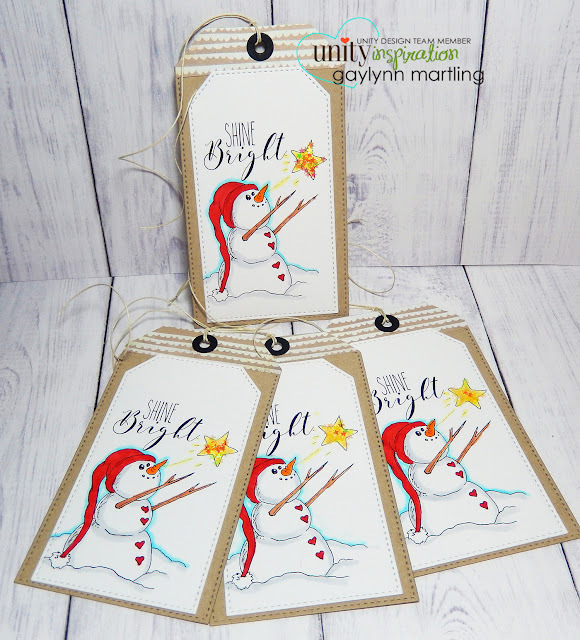 For this page, I combined stamping, coloring and rub-on embellishments. For the girl, I used Copic markers and fine liner pens on trimmed cardstock. When I color with Copics, I always do so on a separate paper piece because of the bleed through of the ink. I do this with stamping sometimes too, depending on the ink used. I used a sheet of decorative rub-on embellishments that easily added a pretty background for this planner girl and sentiment. 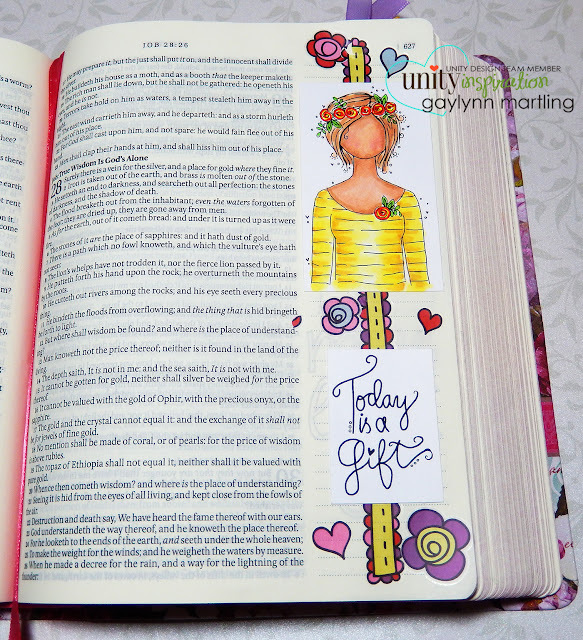 If you would like to see more of my bible journaling projects, click bible journal. I documented different techniques while experimenting with decorating on the thin bible pages. Here is a quick tip video of this planner girl page. Supplies: Unity Stamp Co. Planner Gal: Today, Copic markers, cardstock, Fancy Pants Designs rub-ons, My Creative Bible, Staedtler Triplus Fineliner pens. 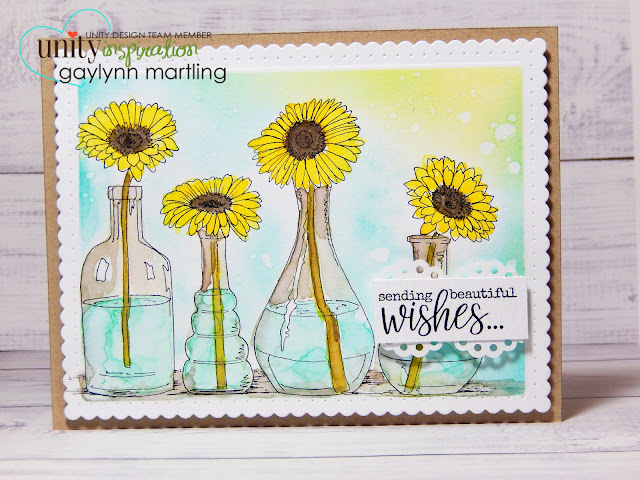 Hi, Gaylynn here with a project for the collaboration blog hop with CardMaker and Craftin Desert Divas. The full hop lineup is on the CardMaker blog. Hop along with us. Craftin Desert Divas, is hosting a $75 CDD shop credit prize. For this beach scene, I used Ranger distress oxide inks to blend the background and to watercolor the gator. 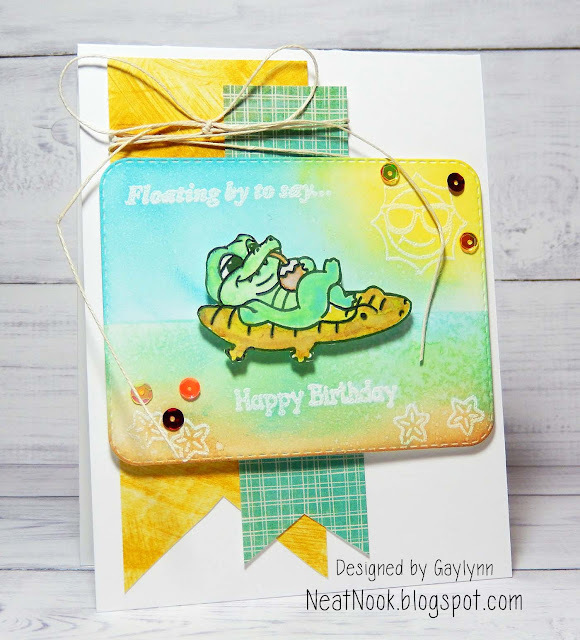 These cute summer images are from the Summer Vibin' stamp kit by Craftin Desert Divas. I made a video tutorial for this beach scene. Your next stop on the hop is the talented Waleska Galindo. Hi, it's Gaylynn. 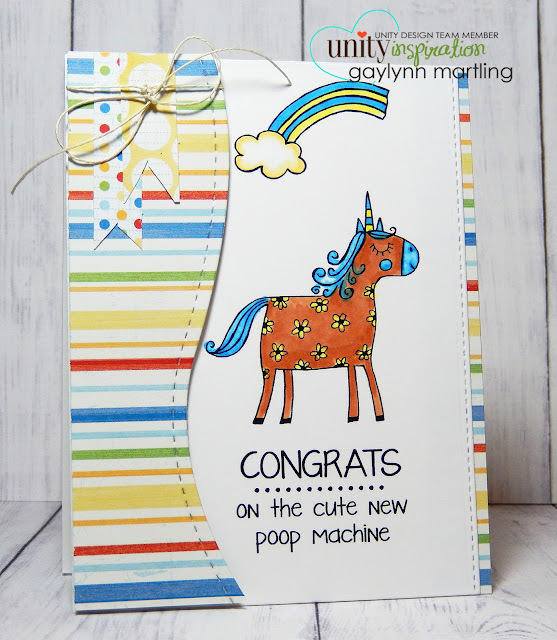 This is part of the Unity Stamp Co. design team blog hop. Hop along with us. Here is a happy card featuring a sweet fairy girl surrounded by joy. A frame was made by repeating the joy sentiment around the fairy. I used markers and fine pens to color in this sweet image. Here is a quick tip video tutorial for this fairy card. Supplies: Unity Fairy Dust by Susan Weckesser, Copic markers and Staedtler Fineliner Pens. Hop along and then check out the Unity store for all of the new releases and the sale. Here is an all occasion card with flowers in vases. I wanted this to look bright and sunny. The blended background and the watercolor was made using distress ink pads. I masked the edges to make a frame. This is perfect for celebrations like birthday, congratulations and more. Supplies: Unity Stamp Co. Free Your Dreams & Hang In There Lady; Ranger distress ink pads & watercolor paper; Winnie and Walter dies. Love your story ~ Uniquely Unity July 2017 kit. Here is a project for Unity's new July monthly membership kit Uniquely Unity. I believe it will be called Whole Love Story. Sentiment: Love your whole story, even if it hasn't been the perfect fairy tale. This features a girl with flowers, colored in with Copic markers. I dry embossed the background and accented with a vine trim. I made a quick tip video tutorial for this girl. Supplies: Unity Stamp Co. July 2017 Uniquely Unity Whole Love Story kit, Copic markers, embossing folder, paper punch, hemp and foam tape. 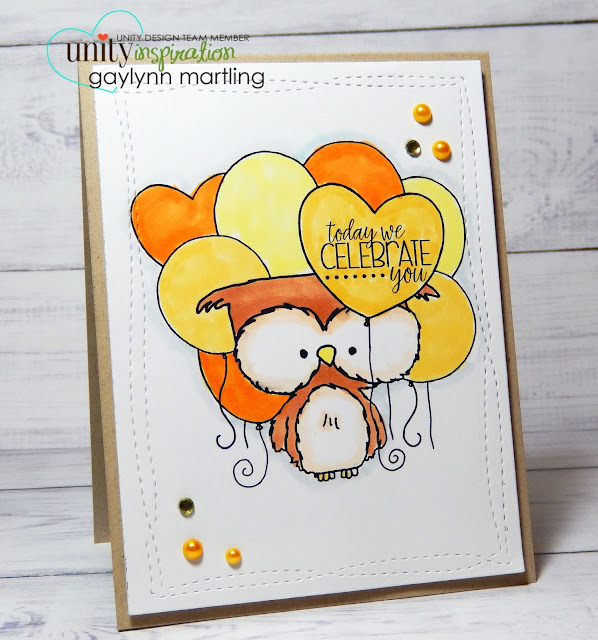 This cute owl Unity kit includes so many fun sentiments. This card is for a birthday. Sentiment: I hope your birthday is full of cake and balloons and love and laughter. This adorable owl was colored in with Copics. 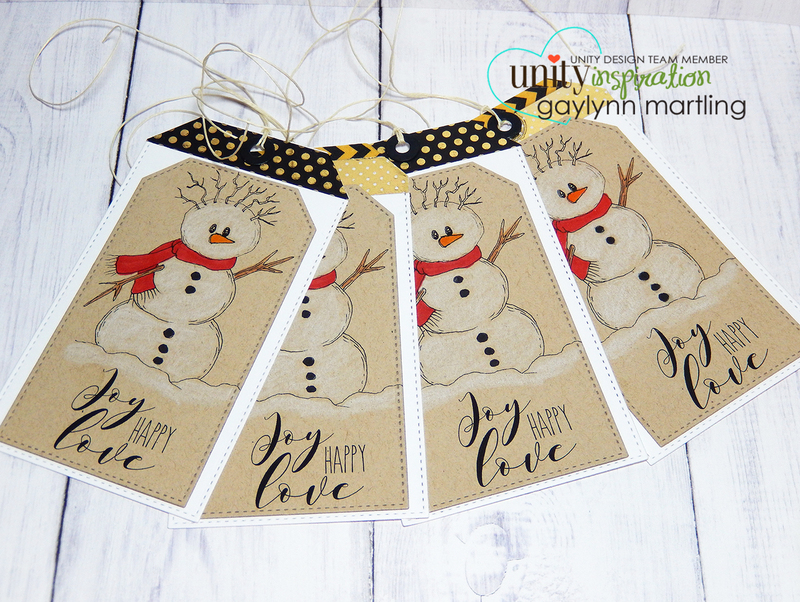 I overlapped a sentiment tag and added a few adhesive gems. Link Up: The Challenge #88 Keywords "birthday"
Supplies: Unity Stamp Co. Hugs, Kisses & Birthday Wishes, Copic markers and adhesive gems. Today we celebrate you owl card. This is an adorable celebration card featuring an owl and balloons. Sentiment: Today, we celebrate you. This is an all occasion card, great for birthday, congratulations, memorial, graduation and more. I think this little owl is the cutest, especially surrounded by all these balloons. Here is a quick tip video tutorial with Copic coloring and sentiment placement. 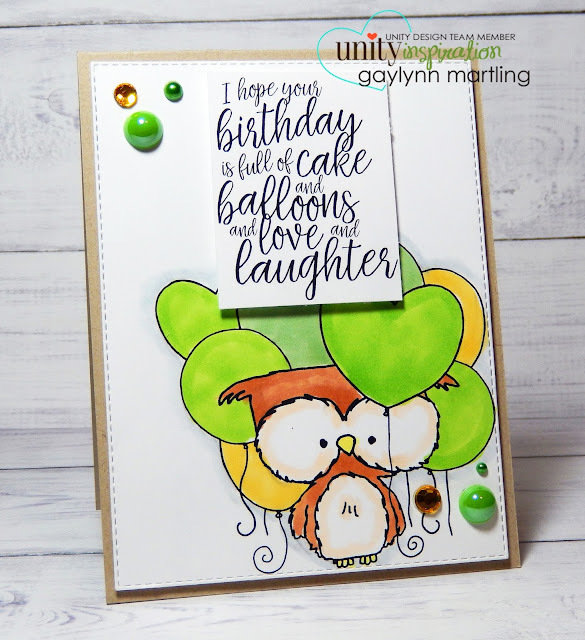 Link Up: Just Us Girls Challenge #400 Word Week "Celebrate"
Supplies: Unity Stamp Co. Hugs, Kisses & Birthday Wishes, Copic markers, Avery Elle dies and adhesive gems.